This is easy to use, easy to apply and quick drying (1-2 minutes a coat). The formula is really good and the brush is excellent. It's an iridescent polish and I love how it looks. It is quite a hard one to describe though... I see flashes of purple and green with the main colour being a kinda grey/pewter. All in all it looks wonderful! Lasted really well. I can notice it changes it shade. Mainly it seems grey. It looks interesting. 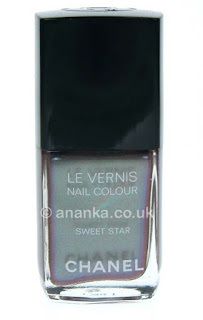 OMG *rubbingeyes* today I envy you a little bit, for Chanel only released 50 pcs. here. It's so gorgeous. It's so gorgeous - and fortunately I will get one in 1-2 weeks, now I look even more forward to it!! Wow no conocia este esmalte, es realmente bonito! These polishes make me curious of trying them over several creme bases just to see them shifting from a shade to another. This Chanel is really intriguing! That's a pretty polish! I wonder if this special edition will reach our stores (must check my local Sephora), I love duochromes!